Validity: 1 July - 31 August 2018, 3pm to 6pm. Last order at 530pm. 11B/SAFRA card must be presented when ordering and making payment. No splitting of bill and/or table allowed. Only one SAFRA membership cardholder or Servicemen (11B) holder allowed per table and/or bill. The Management reserves the right to amend or withdraw any/all of the terms & conditions at any time, without prior notice. Valid from Mon - Fri, excluding eves of and Public Holidays. 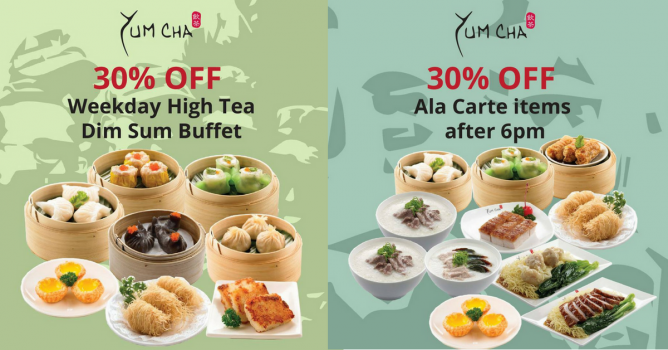 Valid at Yum Cha Changi only.